DUCHESS OF OLDENBURG was one of four pioneers among Russian apples in America, along with Alexander, Tetofsky and Red Astrachan. All four were imported by the Massachusetts Horticultural Society around 1835. In European nurseries, the Oldenburg was propagated under the names Charlamowsky and Borowitsky. An extremely hardy variety, Oldenburgs “kept up the hope of prairie orchardists in times of great discouragement,” according to The Apples of New York, Volume II, by S. A. Beach (J. B. Lyon Co., 1905). The Duchess of Oldenburg is a stunning apple, with beautiful, yellow-and-red striped skin. Its flesh is yellowish, firm, crisp and juicy. A highly aromatic apple, it has excellent culinary qualities. A relative of the Duchess of Oldenburg is another heirloom, Gravenstein. Beach’s classic apple encyclopedia calls the Gravenstein “perhaps unexcelled by any variety of its season” for culinary purposes. Its origin is unclear, he writes, although “it is undoubtedly of similar origin with the Red Astrachan and Duchess of Oldenburg.” Gravensteins, like the Oldenburg, were imported to the United States by the Massachusetts Horticultural Society in the late 1820s. A newer apple variety is also ready for picking where it is grown in New England orchards. Sansa was developed in New Zealand in 1969 and introduced in the United States in 1986. 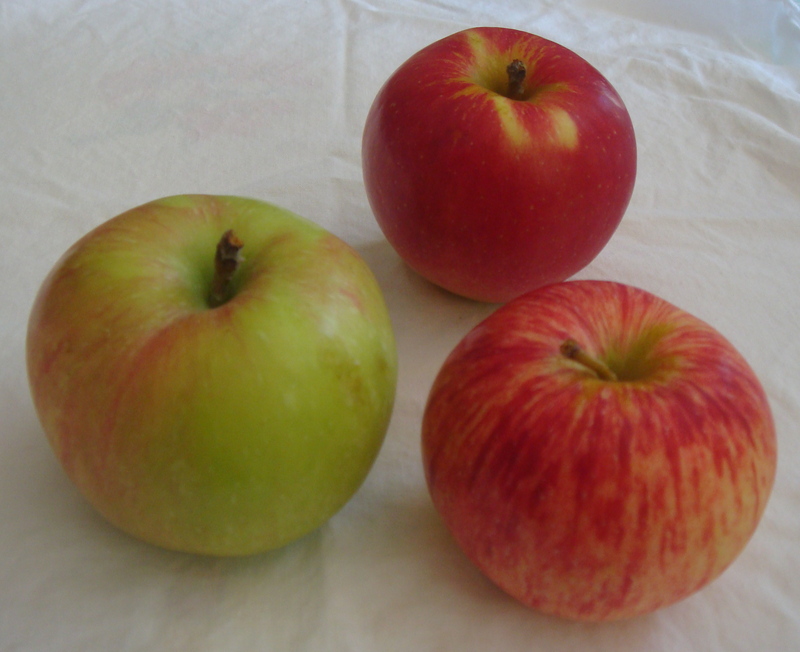 A cross between Gala and Akane, it is a red, medium large apple. Sansas are sweet apples, with a deep pink blush on a yellow skin. Its firm flesh is light green in color, and tender and juicy. Try this moist and low-fat loaf cake that uses applesauce as a substitute for the oil (or butter or shortening). Old-fashioned oats are best to give this cake an even chewier texture and flavor. If available, try using white whole wheat flour in place of the denser whole wheat variety. Mix early season varieties like Duchess of Oldenburg, Gravenstein, Sansa and PaulaRed to make your own applesauce. Simply quarter the apples and cook in a saucepan with cider or water until soft, and strain through a food mill. Use several apple varieties to give your sauce and cake a distinctive flavor. Pour 1-1/4 c hot water over 1 c oats. Cover and let stand 15 minutes. Stir in the oat mixture and 1 c raisins. Pour into a greased and floured 8” x 8” square pan and bake for 50-55 minutes. Beginning that evening through the weekend, the New England Apple Association and Massachusetts Department of Agricultural Resources will sample apples and give away recipes, brochures and other educational materials at a booth at the Sterling Fair.